Costa Rica Will Do Away With Caged Animals At Its Zoos : The Two-Way The minister for the environment said it was time for the country to move beyond caging wild animals and seek a more natural experience. 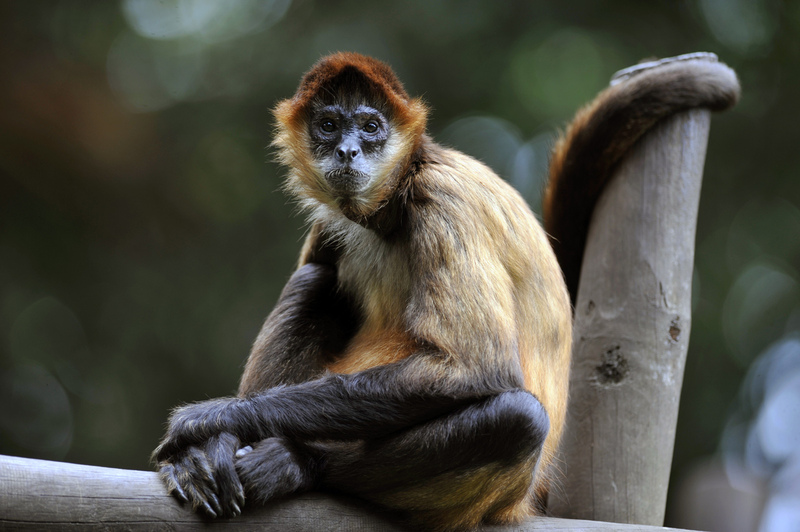 A spider monkey sits inside its cage last month at the Simon Bolivar Zoo, which recently celebrated its 97th anniversary, in San Jose, Costa Rica. Here's a bit of news that has been making the rounds in Costa Rica for more than a week but is just now picking up steam stateside: Saying it's time for a more natural experience, Costa Rica's minister for energy and environment said they would get rid of caged animals at the country's public zoos by next year. "Environment Minister Rene Castro announced in recent days that the 97-year-old Simon Bolivar zoo in central San Jose will become a botanical park next year. Another zoo west of the city, the Santa Ana Conservation Center, also would close. Together they hold 400 animals of 60 species, including a lion, crocodiles, monkeys and a tapir. "The Environment Ministry said the animals would be released into the wild or sent to rescue centers." El País Costa Rica quotes Castro as saying: "We're going to get rid of cages and reinforce the concept of a botanical park so the biodiversity can be shown and interacted with in a natural manner. We don't want any more captivity, any more caging of animals, unless it's because they're being rescued or saved." Costa Rica's La Nacion spoke to Castro over the weekend. His department was releasing the results of a study that found one of four people in Costa Rica keep wild animals in captivity. "One day, she let the parrot out to the patio and a bunch of wild parrots flew by," Castro told the paper. "Our parrot flew with them. And it affected me tremendously, because I thought we cared for it well, we gave it food and love, all those things that as humans, we believed that she liked. But when it had an opportunity, it escaped." The AP reports that the foundation that runs the zoos "has asked an administrative tribunal to block the closure."